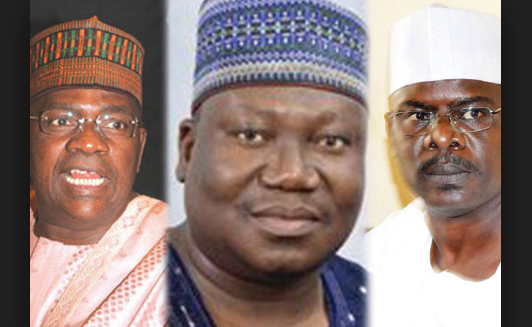 Indications are rife that the leadership of the All Progressives Congress (APC) is set to wield the big stick against Senators Ali Ndume and Danjuma Goje as well as other erring members, who flout it’s directives on the election of the National Assembly leadership. This is coming as a result of intrigues and horse-trading that have recently characterised the position of the Senate President, in which some members are now against the decision of the party. The party had earlier taken a position on the matter, zoning the Senate Presidency to the North East and endorsing Senator Ahmed Lawan as its preferred choice. But some senators are said to be against the choice of the party, leading to dissenting tunes among the federal lawmakers. While Ndume has consistently insisted on running for the senate presidency, Goje has yet to make his position public but being thronged on by his supporters, who want him to run for the exalted office. Telegraph investigations however revealed that the leadership of the party, headed by Comrade Adams Oshiomhole, is not ready to go into any form of negotiation, with a view to pacifying those rebelling against the party’s decision. Sources close to the APC leadership informed our correspondent that the “anti-party activities” currently being displayed by some key members of the party, will result in suspension or outright expulsion of some chieftains of the APC within and outside the National Assembly. This, one of the sources said, is because of the recalcitrant attitude of some members of the party bigwigs, who are said to be supporting the rebellious cause of some of the lawmakers. A source that is close to the top echelon of the party told Saturday Telegraph that “any matter concerning the emergence of the leadership of the ninth assembly is strictly a decision to be made by the party’s leadership”. When probed further on the stance of the party and the purported disagreement within the ranks, the new House of Representatives member-elect, said; “Anybody, who defiantly violates the party’s zoning arrangement for the emergence of the leadership of the ninth assembly in June this year, would be made to face the penalty”. He noted that Oshiomhole and the National Leader of the party, Asiwaju Bola Tinubu, had warned the newly elected members not to toe the line of some ranking members, who are set to disobey the party. “Some key people including the national leader and the chairman had warned us not to go contrary to the publicly announced party’s zoning arrangement. Those going against them are likely going to be indefinitely suspended, if not expelled. “If you will recall, the leader had last week said that anyone that is not in agreement with the party’s decision should quietly leave our fold. They have been advised to go to another party, but since they have refused to go on their own, the party will have to wield the big stick”, he said. Another source, who is a Peoples Democratic Party (PDP) defector noted that the APC leaders were particularly angered by the steps being taken by some members of the opposition, who are positioning themselves to take advantage of the division within the APC lawmakers. 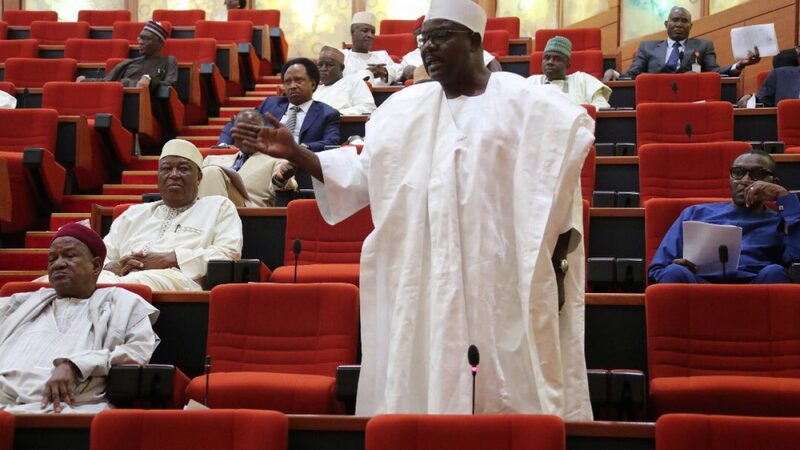 “Just like what happened earlier, members of the opposition PDP in the Senate are planning to take advantage of the cracks in the ruling party to field a candidate to produce the next President of the ninth Senate”, he said, adding that Ndume is risking expulsion from the party if he fails to drop his ambition to contest for the senate presidency. Checks by Telegraph further revealed that there are three possible candidates from the PDP jostling for the position of the Senate President. They are Senators Ike Ekweremadu, who is the current Deputy President of the Senate, Senator Enyinnaya Abaribe (PDP, Abia South) and James Manager (PDP, Delta South). The PDP trio, sources said, would have a fierce contest among themselves, noting however that Abaribe is the preferred choice of the PDP among these three. Analysing the chances of the PDP candidates, a member of the opposition within the Senate said those against Ekweremadu are those that feel he had been too long in the saddle and there is need to have a fresh blood in the leadership. “The number one reason which favours Abaribe over the other two, is that other senators who have been in the Assembly since 2007 will be having a sense of monotony to continue to have Ekweremadu presiding over them. “But others are of the opinion that, though Manager is well experienced and also qualifies to hold the office, Abaribe is perceived to have more public acceptance among his colleagues, especially with the high level of carriage and articulation with which he has operated in the Red Chamber in the last 12 years”. He however argued that, with 41 members, it would be difficult for his party to win the race, except the PDP could get the support of about 14 members from the ruling APC. “It will be difficult for us in the opposition to produce the President of the Senate. Unless we are able to woo not less 14 APC senators, we can’t pull any magic. We need simple majority of 55 out of 109 senators to give us victory,” he said.